Vitamin D is an extremely important vitamin for your skin and beauty, bones and strength, and overall health and immunity. However, an estimated one-billion people worldwide have a vitamin D deficiency. It’s important to know what vitamin D is, how to discern if you’re are lacking this vital vitamin, and what you can do about it. Vitamin D is a fat-soluble vitamin, meaning it can travel into your blood circulation and be stored in your body’s tissues. It’s the only vitamin that can be produced in the body on its own, making it more of a hormone than a vitamin. It does so when your skin has direct sun exposure. It can also be found in some food sources as well as vitamin-D supplementation. Once your body takes in vitamin D, chemical processes in your liver allow it to absorb into your blood. Your blood then directs it through your tissues and in your kidney. There, it turns into activated vitamin D (also known as calcitriol). In this activated form, it now supports the calcium supply and absorption by your blood, bones, and gut. It helps the cells in your body to grow and function properly. 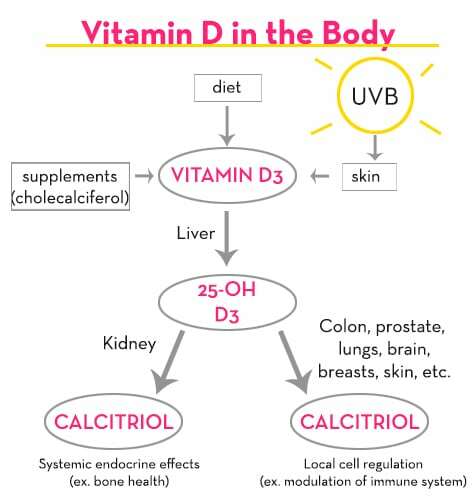 Here’s how vitamin D works in the body from any of the three sources. As vitamin D plays a pivotal role in your body, it’s important to ensure your body gets enough of it. However, research has shown that a large percentage of people don’t. Your geographic region plays a large role on your ability to get vitamin D from sunshine. The Harvard Health blog states unfortunate findings. Outside of summer, there’s little to no chance of getting vitamin D from the sun for those at latitudes above 37 degrees north (a high percentage of the US) or 37 degrees south of the equator. See the map of the US below to see if your area falls into this category. But it’s not just those below the 37th degree that can be vitamin-D deficient. 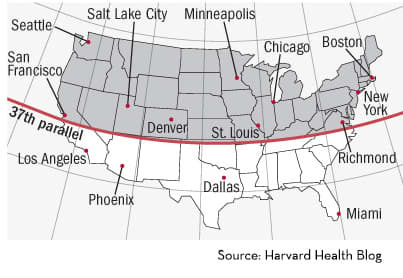 Even in sunshine locales like southern California, deficiency is prevalent due to the extensive use of—and need for—sunscreen. Also, anyone who doesn’t spend sufficient time in sunlight can have a vitamin-D deficiency. The recommended time varies due to a variety of factors. For instance, those with darker skin have a greater chance of being deficient because skin pigments act as natural sun protection. One study showed that a black man in Chicago needs at least 90 minutes in the sun three times a week to produce the same amount of vitamin D as a white man in Chicago can in 15 minutes three times a week. When sun exposure is simply not an option, natural food sources, vitamin D-fortified foods, and supplementation are options. Because of the prevalence of vitamin-D deficiency and the role it plays in your body, it’s important to know the signs. If you think you might be missing out on vitamin D, connect with your doctor about getting tested for the next steps. Here are five signs that your body might have a vitamin-D deficiency. Vitamin D plays an important role in protecting skin cell health, reducing wrinkles, improving skin softness, and maintaining a smooth, glowing complexion. At the same time, UV rays from extensive sun exposure can harm the health of your skin cells. In fact, they can be dangerous to your health. It’s important to be careful to find the right balance, and we’ll discuss more on this below. Part of this process extends to issues with acne or eczema when you have a vitamin-D deficiency. Because vitamin D is a hormone, a deficiency can likely have an affect on your other hormones. Thus, a hormone imbalance is possible. In addition, proper vitamin-D levels stimulate your T-cells to fight infection, including the acne bacteria. Vitamin D is also known to cool inflammation and control your insulin response. It’s helpful in reducing severe skin conditions such as acne or eczema. A vitamin-D deficiency can play a role in autoimmune diseases such as multiple sclerosis (MS), type-1 diabetes, or IBS. Researchers have found MS rates to be higher far north or far south of the equator, where exposure to sunlight is more limited. 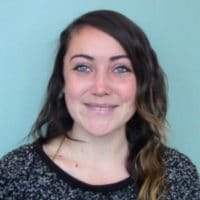 One Finnish study found that children who regularly took vitamin-D supplements during infancy had a 90% lower risk of developing type-1 diabetes than those who didn’t. If you believe you may have a vitamin-D deficiency, we recommend speaking with your doctor to get your vitamin-D levels tested. Here are a few preventative and restorative steps you can take naturally on your own. Direct sun exposure makes the most sense for boosting your vitamin D levels. However, there are a number of factors that can make this not a nonviable option. Winter months, cold climates, and busy workdays can make the daily recommended exposure to sun impossible. Even during summer, SPF greater than eight blocks the ability of your skin to absorb vitamin D3. Consequently, it can be difficult to get the sun nutrients without exposing yourself to the dangers of overexposure. – Time of year and time of day: The closer it is to midday, the more exposure your body gets to vitamin D. Here’s a tip: Make sure your shadow is shorter than your actual height to get optimal D exposure. – Color of your skin: As mentioned earlier, the fairer your skin is, the less time you’ll need to be in the sun to absorb UV rays. The darker your skin is, the more time you’ll need, scaling from 15 to 90 minutes. – Amount of skin you expose: The more skin you expose, the more vitamin D you can produce. Forearm, rather than facial, exposure is best for vitamin-D uptake. – Factors that block UVB: Glass blocks UVB but not UVA, so it’s not safe to attempt to get your daily sunshine vitamin from through a window. In addition, sunscreens with SPF ratings above eight effectively block the synthesis of vitamin D in the skin. – Note for tanning: Use low-pressure beds with a good amount of UVB light rather than high-intensity UVA light. It’s possible to get some vitamin D from a few food sources, though it can be difficult to get your recommended levels. Fish is an especially helpful supply, particularly wild, low-mercury salmon and mackerel. In addition, mushrooms grown with exposure to UV light (versus the many mushrooms grown in the dark which would not provide vitamin D) are also a good food source. Additionally, some milk and yogurt fortified with vitamin D (nearly all cow’s milk in the US is fortified) can help you reach your recommended levels, but likely not on their own. An eight-ounce glass of milk contains at least 100 IUs, and a six-ounce yogurt usually contains 80 IUs. In cases when it is not possible to get vitamin D through sun exposure, take supplements. Vitamin-D supplements use two forms: D2 (ergocalciferol) and D3 (cholecalciferol). The D3 is the same chemically as produced in the body and is thus the preferred form. Vitamin D is measured in IU, the International Unit usually used to measure fat-soluble vitamins including A, D, and E. The recommended dose of vitamin D is up for debate among medical professionals. However, the upper limit notes the degree to which safety is assumed, and is at 4,000 IUs per day. 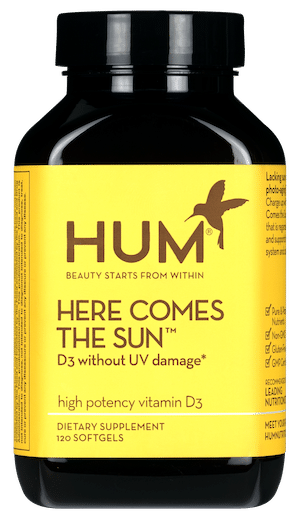 Based on an analysis of the research and recommendations by our top nutritionists on efficacy, HUM’s vitamin-D supplement, Here Comes the Sun, contains 2,000 IUs per day of the superior form of cholecalciferol.